We had always thought that the African identity was only battered in literary texts maybe because we were among "the doubting Thomases" of our time and weren't born into any of the societies these writers project in their literary works. However, with the recent happenings across the world, it is an undeniable fact that literary texts reflect the society we live in. Apart from our kids and the unborn generation(s), we no longer need literary texts like Athol Fugard's Sizwe Bansi is Dead, Lorraine Hansberry's A Raising in the Sun, Richard Wright's Native Son and Black Boy, and Joseph Conrad's Heart of Darkness to expose the deliberate attempts of the West to batter the identity of anything that is African either by birth or skin colour as the drama is now on REPLAY on a daily basis. Westerners had always seen Africans as savage beings since time immemorial, and the present generation of the West is not thinking of wiping this ill perception of Africa off her mind yet. Joseph Conrad, in his classic tale, Heart of Darkness, describes Africa as a wild "dark" and "uncivilized" continent. In one of his writings, John Locke, a merchant who sailed to West Africa in 1561, describes Africans as "...people without heads having their mouth and eyes in their breast." As if that wasn't enough, few weeks ago, the President of the United States of America, Donald Trump, referred to all African countries as "shithole countries". The recent attack on the Nigerian personality, and by extension, the African identity by a French journalist, Caroline Broué, cannot be swept under the carpet. 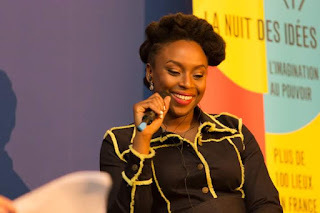 During an on-stage interview with the Nigerian-born writer, Chimamanda Ngozi Adichie, at the launch of the "La Nuit Des Idees" (The night of ideas) in Paris, Caroline Broué indirectly but intentionally debased the Nigerian identity when she asked the writer whether or not Nigeria has bookshops. This question of the French journalist suggests nothing other than portraying Nigeria as a country of illiterates with no reading culture. By extension, according to Adichie, the question "...was about giving legitimacy to a deliberate, entitled, tiresome, sweeping, base ignorance about Africa." It was obvious that Adichie had no patience for such arrant nonsense hence her savage reply, "I think it reflects poorly on France that you asked that question." The West's continual projection of Africa as barbaric, uncultured, ever-backward and a continent whose inhabitants are animals in human form despite her noticeable achievements in the international community shares striking similarities with Adichie's definition of a single story. According to Adichie, a single story "shows a people as one thing, as only one thing over and over again, and that thing is what they become." The single story creates a stereotype and makes one story to become the only story of a people. It is, therefore, obvious that Caroline Broué has a single story about Nigeria by stating that the French knew nothing about Nigeria aside Boko Haram and the insecurity problems caressing the nation. Caroline Broué's claim is not only a sheer display of hypocrisy but a validation of the claim that Westerners deliberately demean the African identity. As regards this issue, African writers have never remained mute; through their pens, they have countered the ill perception of Africa by their Western counterparts. Prominent among them was Chinua Achebe who used his first novel, Things Fall Apart, to counter Joseph Conrad's uncouth perception of Africans and Africa. The most prolific writer of her generation, Adichie, is not left out in this fierce battle. She has fought tooth and nail to preserve anything that is African. Her recent peaceful quarrel with the French journalist, Caroline Broué, is a clear indication that Adichie is one of those Africans who will never trade the African heritage for anything, not even a good treat. Adichie's savage response to the interviewer's debasing question about Nigeria has won her precious places in the hearts of many individuals across the globe, the French inclusive. If you are looking for any reason to love Adichie, or triple your love for her, either of these reasons should end your search. On the occasion of the "questionable question" asked by the French journalist, Adichie brilliantly divested intellectual battle from bloodshed. She made a firm and clear statement which spared Nigeria grave debasement and international ridicule, delivering it with so masterly a calm that wouldn't call for any French retaliation nor reflect any ulterior motive or intention. She has shown that Nigeria does not only have bookshops but also has sound thinkers and scholars. She sets our nation Nigeria conspicuously on the world map. Adichie apparently takes a backpack of Nigeria with her as she tours the nations of the world. She has attained lofty heights and has managed to maintain relevance within the international space. She continually brings glory to Nigeria and is unrelenting in her defence of the nation as well as the portrayal of its image in positive light. She has remained indigenously African in lifestyle, art and values despite the major part of her life spent abroad. She has not been swallowed up by the lifestyle, philosophy and mundane activities of the Western world but continually projects the African ideals in her works. The Nigerian setting and particularly the Igbo culture and the language remain familiar materials in her works. She is a testimony of intellectual success at a time when majority think education should be relegated to the background as it doesn't really make anyone great nor achieve resounding feats. She has proven beyond every reasonable doubt that knowledge is great power. Describing Adichie in the wake of her writing career in his lifetime, the Late Chinua Achebe said: "Here is a new writer endowed with the gift of ancient storytellers...Adichie came almost fully made". Sustaining the good legacy of Late Achebe, she successfully paves a contemporary pathway for young Nigerian scholars to thrive. She is a national role model who has earned her spot, fitting in snugly. It seems to be that there is a gargantuan African tongue that has been deployed by the eternally remarkable Chinua Achebe of blessed memory, Chimamanda Ngozi Adichie and few others. Adichie has cut a big portion of this continental tongue with which she has successfully filled her mouth. Tamuno Aribibia Reuben and Boma Batubo think it is expedient that all genuine Africans through whose veins the beautiful black blood flows pick up intellectual knives and cut off portions of this massive tongue for themselves if our identity must be defended and the precious image of our continent salvaged.